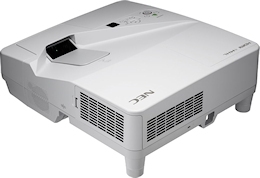 NEC’s UM351W is a 3500-lumen ultra short throw projector that packs a multitude of features while delivering an extremely short throw distance for education and corporate applications. A complete interactive projector solution can be created using the optional NP03Wi interactive system (dual pens) with auto calibration. The UM351WG projector also has a viewer function that lets you project images (JPEG) stored on USB memory, so you can give presentations without a computer. This function enables the remote control to be used to adjust volume of self-powered external speakers that are connected to the um351wg projector. Lamps can blow, if you need your projector working and can't afford down time, you may need to keep a spare lamp. The replacement projector lamp for the NEC UM351wg is the NP33LP.